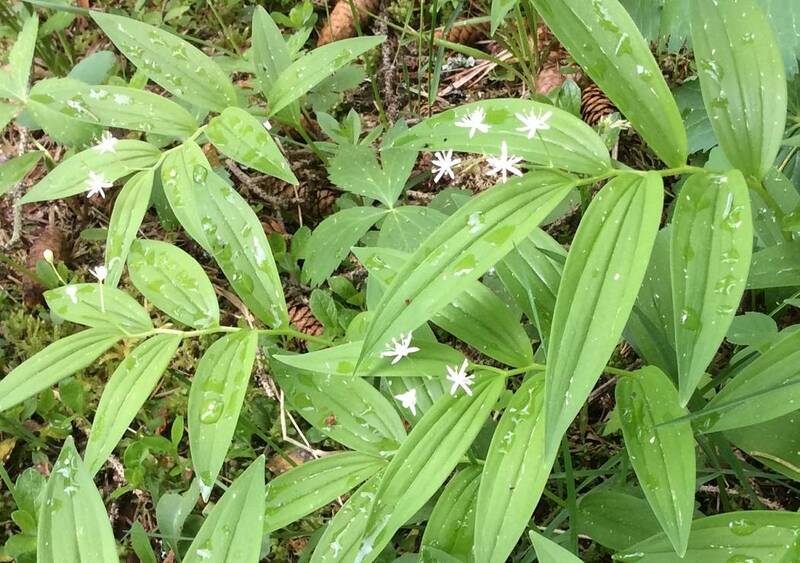 Can you identify these Glacier National Park Wildflowers? In our first blog post on Glacier National Park Wildflowers, we talked about some of the more popular and easier to find Wildflowers. In this blog post, we will talk about a few more of the wildflowers that grow and flourish near Smoky Bear Ranch and in Glacier National Park. The Wild Lily of the Valley has 5-10 small creamy white star shaped flowers at the end of the stem. The “zig-zag” stems have many lance shaped leaves and often they’ll have fine hairs on the lower side. The flowers produce a greenish yellow berry with 3 red stripes and turn to red or black when aged. 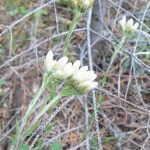 These wildflowers will bloom in May and June and prefer moist to rather dry habitats. You’ll find them in valleys to lower subalpine forests. The plants have dangerously poisonous compounds which cause a digitalis like effect on the heart disturbing the heartbeat. The berries are edible but not very tasty. Eating too many of the berries will unleash their laxative properties. The Wild Lily of the Valley is sometimes referred to as “starry Solomon’s seal”. Three varieties of Pussytoes thrive as Glacier National Park Wildflowers – Rosy Pussytoes, Field Pussytoes, and Woods Pussytoes. All three varieties are members of the Aster Family. The Rosy Pussytoes are a low, mat-forming perennial that spread by trailing stems. The gray leaves are equally woolly hairy on both surfaces and are spatula shaped. The basal shaped leaves at the base are larger than the spatula shaped leave which are sparsely located along the 2 to 12 inch long slender stem. The overlapping bracts at the base of the flower are dry, thin, and translucent. The bracts vary in color from rosy red to white with white disk flowers arranged in a small tight cluster at the end of the stem. 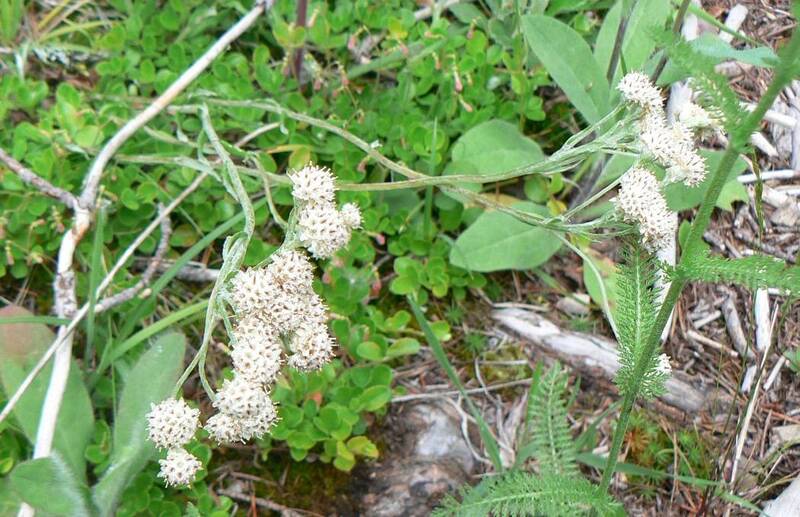 These wildflowers like dry to slightly moist soils in valleys to lower subalpine forests. They bloom from June through August. Herbalists claim pussytoes is a mild astringent herb and useful in quieting simple intestinal and liver inflammations. Field Pussytoes have 8-16 inch stems with hair on the upper part. Their basal shaped leaves up to 2 inches long and form a mat a the base of the plant. The narrow spatula shaped leaves on the stem are dull green and slightly woolly on the upper side. Numerous flower heads crowd the end of the stem and are partially closed by white, narrow, pointed bracts. 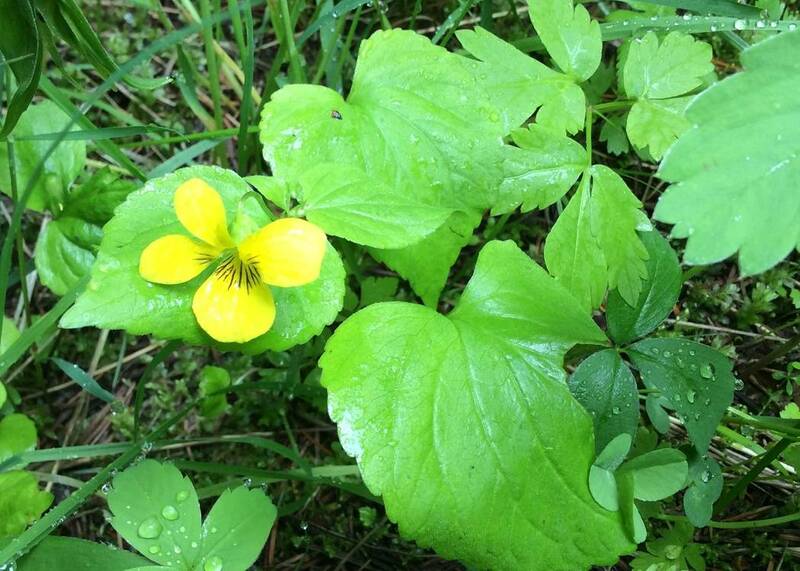 These wildflowers are found in open forests from valleys to lower subalpine forests. They are a mild astringent herb which the American Indian used for medicinal purposes. Woods Pussytoes form a ground cover in shady forests. They reproduce by runners like a strawberry. The dull green upper leaf surface is smooth while the underside is white with dense woolly hair. The main flowering stem is 4-24 inches tall. The unisex flower heads occur in panicle-like arrangements on the end of long stalks. Male and female flowers are on separate plants. They bloom from May to August and prefer cool, shaded woods in valleys and montane and subalpine forests. 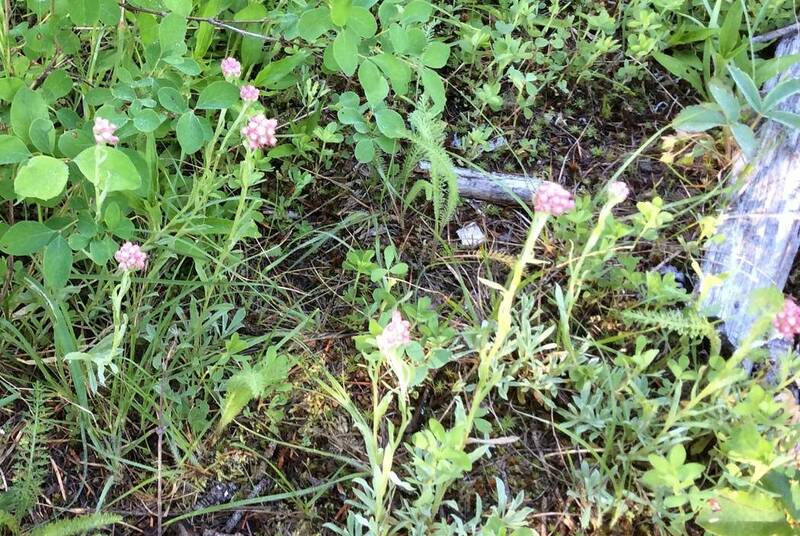 Herbalists say Woods Pussytoes are good for treating liver inflammations and upper intestinal irritations. Glacier National Park Wildflowers include several varieties of Violets. At Smoky Bear Ranch, we are treated to three of those varieties – the Canada Violet, the Early Blue Violet, and the Stream Violet. The Canada Violet is considered to be one of the larger violets with stems 4-16 inches tall. They have heart shaped leaves with fine teeth and a fringe of hair on the margin. The leaves become smaller near the top of the stem. The flowers have 5 white petals located at the end of the stem just above the leaves. Each flower has purple lines on the inner surface of the lower 3 petals to direct the pollinating insects to the nectar pouch. The two upper petals have small tufts of hairs near the throat of the flower where there is a conspicuous yellow patch on all the petals. The petals have a purplish tinge on the outer surface and often turn lavender as they age. The flowers are replaced by an oval seed capsule up to ½” long. This capsule is initially green, but later it turns brown and divides into 3 segments, flinging the seeds. 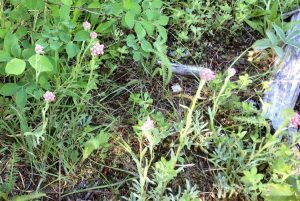 This wildflower blooms from May to July and prefers damp woods with the rich, loamy soil of montane and subalpine forests. It is known to be edible with medicinal properties. The leaves of the Early Blue Violet are egg shaped to heart shaped with finely rounded teeth on the margins. The leaves appear at the base of the stem at first but later develop leafy stems up to 4” long. It has a 5 petal purple flower The 3 bottom petals are white at the center with dark purple veins to lead pollinating insects to it’s nectar pouch. The petals to the side of the lowest petal have white beards and hook backwards into a spur. 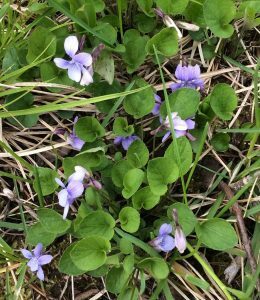 The Early Blue Violets are some of the first to bloom in the spring. They bloom from April to August. They prefer dry to moist meadows and you can find them from valleys all the way up to near timberline. These violets are edible either fresh in a salad or cooked as a potherb. 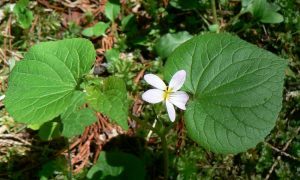 The leaves are very rich in vitamin A and C.
The Stream Violet has stems 2-12 inches long with it’s leaves and flowers on the upper 1/3 of the stem. It has glossy, heart shaped leaves with a pointed tip and minute teeth on the margin. The flowers are yellow on both the front and back side of it’s 5 petals. Purplish pencil like lines decorate the lower 3 petals to guide the pollinating insects to the nectar pouch with fine hair trims on the upper 2 petals. 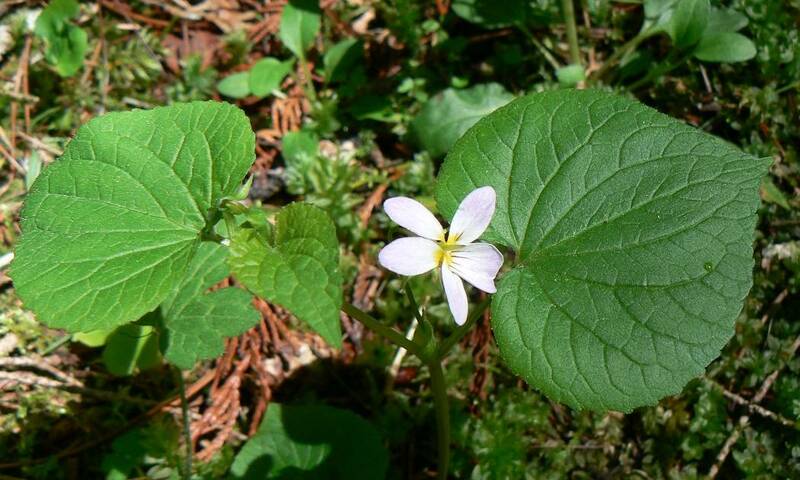 This wildflower blooms from April to July and prefers streams and damp woods of montane and subalpine forests. They are a nutritious, edible herb high in vitamin A and C. It is a versatile plant used as a potherb, in salads, to thicken soup, flavor vinegar, and brew a delicious tea. A word of caution when eating the yellow flowers in quantity, it can cause diarrhea. 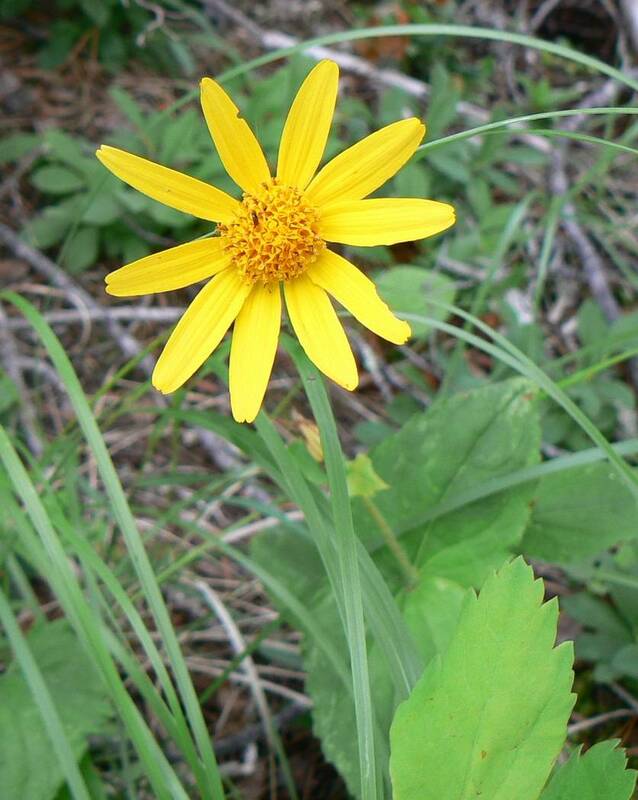 The lance shaped leaves of the Mountain Arnica are opposite on it’s 7-24 inches tall stem. The lower leave are brightly colored with rounded tips and level to the ground. The middle leaves on the stem are typically a big as those lower down on the stem. The upper leaves are smaller and spear shaped. The flower, atop the stem, consists of yellow rays surrounding yellow disk florets. 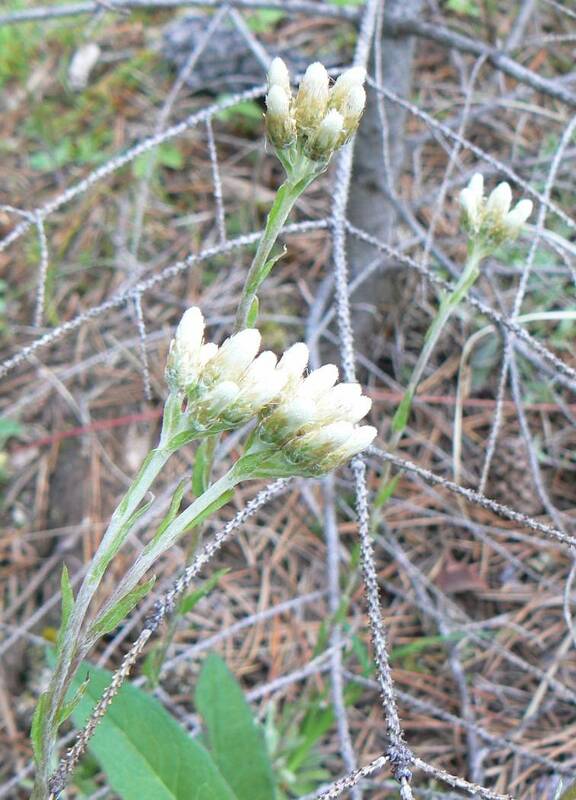 This wildflower blooms in June and July and prefers moist woods from dry montane forests to timberline. 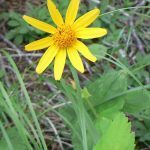 Some American Indians value the Mountain Arnica as a love charm. They also use the roots and leaves for medicinal purposes to heal bruises and reduce swelling. Herbalist prepare a liniment from it to improve circulation and speed the healing of injuries to include sprains, sore muscles, and strained joints. However, the plant contains many toxins so should not be taken internally or applied to broken skin. Two varieties of Wild Roses adorn my river path – the Woods Rose and the Nootka Rose. I just love it when they’re in bloom as the aroma is so wonderful. The Woods Rose is more commonly seen at Smoky Bear Ranch. The 3-6 foot tall bushes have stout prickles just below leaf nodes and smaller prickles between the leaves. It’s compound leaves have 5-9 leaflets with coarse teeth. They flower in clusters at the end of lateral branches. The pink flowers have 5 petals ranging 1/2” to 1” long while the 5 green sepals are 3/8” to 3/4” long. The rose hip fruit develops once flowering is complete. This wild flower blooms from May to July and prefers moist areas in valleys and montane forests. The Wild Rose is the floral emblem for Alberta, North Dakota, and New York. The have been used for food, medicine, and cosmetics. Rose hips are an excellent source of vitamin C and also make very nice tea, syrup, or jam. The American Indian used Woods Roses as a beverage cure for colds, to stimulate urination, to treat diarrhea, and as a dressing for wounds. 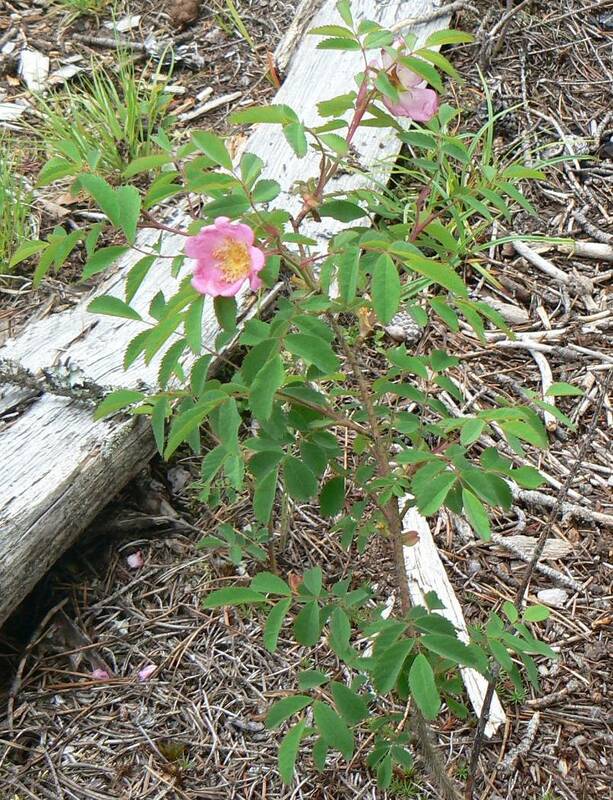 The Nootka Rose is similar to the Woods Rose except it’s flowers are pink to deep rose and solitary on the branches. It too has larger prickles just below the leaf nodes and smaller prickles in between the leaves. The compound leaves have 5-9 leaflets with coarse teeth. My flower book tells me this wild rose has larger flowers but here at Smoky Bear Ranch the Nootka Rose flowers tend to be smaller than the Woods Rose flowers. The rose hip fruit is purplish with long sepals. This wildflower blooms from May to July and prefers moist, wooded areas from montane to lower subalpine forests. 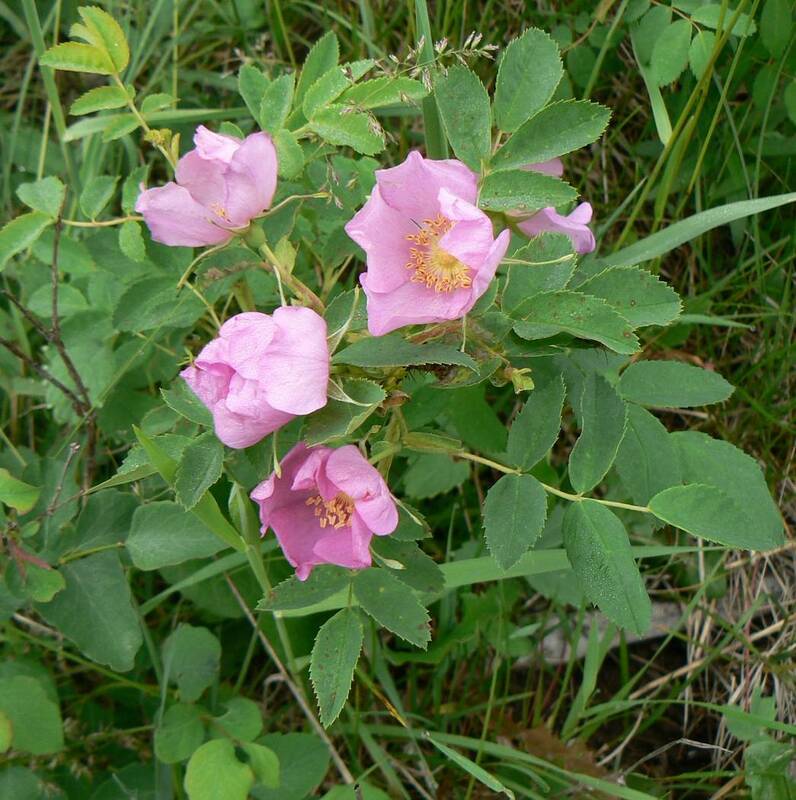 This wild rose was used by the American Indian for healing, food, and fiber. It was used to heal sore eyes, bee stings, sore throats, and to treat vomiting, diarrhea, and swellings. Teas were brewed from it’s rose hips and branches while the petals were used for cosmetics. All of these Glacier National Park Wildflowers bloom along the nature trail at Smoky Bear Ranch. Most of them bloom in June along our trail but some will still be blooming in July and even into August. If you miss seeing them here at Smoky Bear Ranch, many of them will still be blooming along the trails in Glacier National Park at higher elevations.